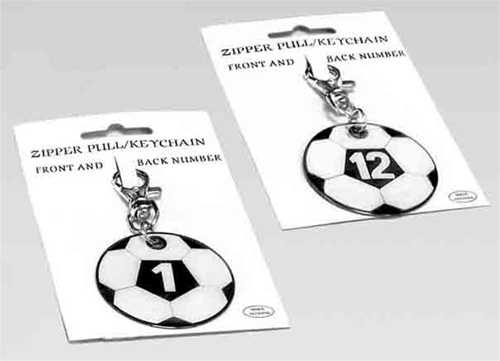 This Personalized Number Keychain / Zipper pull is a fantastic way to personalize your gear! Never worry about losing your bag amongst your teammates again!! Buy them individually, or for the whole team!! Keychain numbers are available 1 through 25. J&K Custom Number Headband Number Personalized Necklaces J & K Soccer Store's Training Bungee Net Adidas Shinguard Straps - Different Colors Available! Soccer Mom keychain Pre Wrap Nike Guard Stay - 4 Different Colors! KwikGoal Shinguard Sleeves- Black & White Available!